This is a very light and clear Romanian soup, one of the top five most common soups we have in our cuisine. Aside from the vegetables and the meat (which are fairly expected), the dumplings introduce an exceptional texture that is bound to impress your guests. Making the dumplings requires a bit of practice, but that is easily achievable because they are prepared separately. 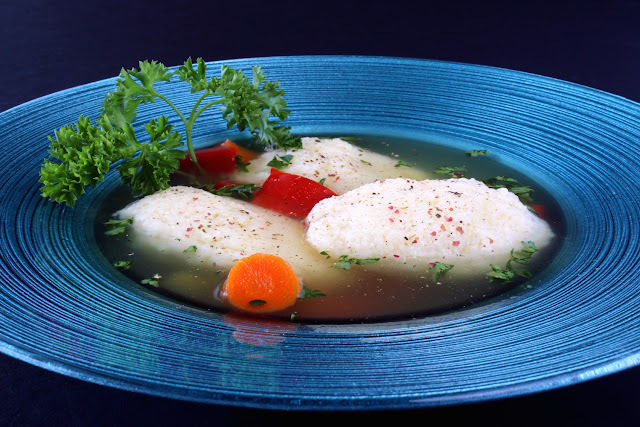 You might even want to start simple: make the dumplings and add them to your favorite chicken soup; if you like the end result, then try following the whole recipe next time. - Chop the parsnips, carrots, celery root, and cauliflower, and boil in two liters of water for about 30 minutes. Use a larger pot, as this is where we'll end up with the final soup. - Add the cubed potatoes and the diced bell pepper and zucchinis to the soup. Add salt and pepper, to taste. Continue cooking everything for another 20 minutes. - Chop the chicken drumsticks (we want to break the bones), and brown the pieces with a teaspoon of cooking oil on medium heat. When browned (not burned), discard the liquid, if any. Add the chopped half onion, and cook together for a few minutes (until the onion turns yellowish). Add one liter of water, one bay leaf, and salt; cover, reduce the heat to medium/low, and simmer for 20 minutes. Sift through a cheesecloth: add the broth to the boiling vegetables from the step above, as well as the meat (separated from the bones), if desired. - Meanwhile, we need to prepare the dumplings. Whisk the two eggs with a mixer for about five minutes, on high speed. Reduce the mixer's speed to low, and gently add the creamy wheat and enough salt as if you'd be preparing an omelet. Mix till uniform. Boil two litters of water separately. When boiling, add a cup of cold water to reduce the heat. Quick add about 3/4 of a tablespoon of batter, and allow it to quickly detach from the spoon: this will grow in size to form a dumpling. Continue until you run out of the mix. Cook for twenty minutes, gently flipping the dumplings from one side to another every 5 minutes or so. Pay careful attention to the water: as soon as it is boiling, add a cup of cold water to cool it off. After the twenty minutes, remove from heat. - At the very end, remove the soup from the heat. Carefully move the dumplings to the soup, one by one; make sure you don't also take the debris, which should be discarded with the water. Add the chopped parsley, and cover. - Serve in a nice colorful bowl. I chose a blue one, as it nicely complements the colors in the dumping soup. - If possible, try to have one of more dumplings break the surface of the soup: it looks more interesting than a flat surface. Then sprinkle some cracked peppers to add some extra depth to the presentation. - Use a nice bunch of curly parsley to further garnish the presentation. This looks really delicious, thanks for sharing this recipe.